Turbans & Head Covers: Designed for Medical Hair Loss- Keeping The Head Warm & Cozy We Price Match! 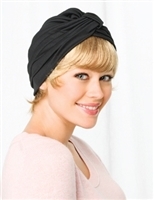 Looking for a quick cover up, try one of our soft and comfortable Turbans or Bandana Headbands. Designed for medical hair loss due to chemotherapy or alopecia. Choose from a wide range of colors, made of soft stretch fabrics. An easy solution for keeping your head warm, while feeling comfortable & cozy too. The Halo hair accessory is the perfect complement to any turban. A velvet lined circle of hair, each Gabor Halo includes two strategically placed hook and loop strips with a glue strip for easy and secure attachment to any turban. The New Softie Hat feels luxurious, made with Bamboo Viscose makes this the most softest head-cover an instant favorite. Introducing the Jon Renau newest 2018 Headwear Collection! This textile collection is inspired by adventure into the depths of nature, propelled by romanticism and rooted in poetry.